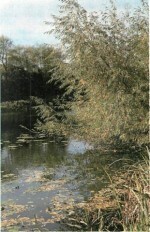 Fenland drain in winter can provide heavyweight nets of roach and bream – as well as prime pike fishing. F enland drains in winter are an entirely different prospect from the placid, still fisheries they appear in summer. Gone is the lily-fringed tranquillity of the warmer months. The cold weather angler who is prepared to brave the bleak Fen landscape is more likely to be confronted with a swirling maelstrom of coloured, fast-flowing water. The Fen drains were excavated centuries ago to drain the low-lying flatlands of eastern England and during the wet weather of winter they do just that – very efficiently indeed. Most of Fenland is actually below sea level, and during periods of extreme wet weather – or the thaw immediately following a heavy snowfall — all the resources of the land-drainage engineers are at full stretch. The Fens in winter are a battleground between nature and human ingenuity – a constant war against water reclaiming what was, until a couple of centuries ago, waterlogged marshland. 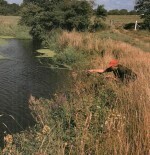 Moreover, since the Fen drains are situated in the east of England, the environment can be very hostile in winter. This is especially true when easterly winds blow in off the cold North Sea, coming straight from the Russian Steppes. But the rewards are there for the hardy angler: catches of roach, bream, pike and zander can then warm the heart of anyone prepared to venture out. Shoals of roach and bream are still present and, unless the flatlands are in the grip of severe Arctic conditions, catches can be every bit as good as those enjoyed in summer. Sometimes better, in fact, for the tight, static shoals of winter can provide heavyweight nets for the angler who has got location and bait presentation spot-on. Mild weather and coloured water can send these fish on feeding frenzies unknown on those hot summer days when the drains are stale and stagnant. The angler can benefit from the shoaling tendencies of roach and bream. The shoals on almost all venues have clearly defined winter quarters that are well known to local anglers, who are usually only too happy to share their knowledge. Following match reports is another way of finding the best swims. Whereas in the summer the shoals are unpredictable and apt to roam far and wide, the prime winter swims offer very consistent fishing. These cold-weather hotspots are usually in the same general vicinity as the areas that produce well in the summer. Gravel-bottomed swims and the pegs close to pylons are often good holding areas. So too are the pegs immediately downstream of bridge supports, and the entrances to side drains. These last two hotspots prove especially good in very wet weather when the water is being run off rapidly and the fish require some shelter from the flow. Bream The resident bream shoals – which in the Fens these days include specimens to 7 lb (3.2kg) or more – don’t require the same amount of groundbait as in summer. Remember, fish are cold blooded and the rate at which they convert food to energy is governed by water temperature – in winter their metabolism slows down so they require less food. So don’t pile in the groundbait – a few trial casts with an open-end feeder are sufficient to tell you if a shoal is in residence. If one is, you can usually keep it in your swim by regularly recasting the feeder, relying on its emptied contents to provide enough feed to keep the shoal interested. Redworms, red maggots and casters are all good baits, but be prepared to fish as fine as a size 20 hook and a 1lb (0.45kg) hook-length if the bream are finicky. Roach Winter is when the Fen’s roach fishing really comes into its own. Summer anglers can take double-figure weights of roach on hemp and tares in balmy weather, but it’s not until autumn onwards that roach fishing here is at its best. A small block-end feeder can pick up quality roach when conditions are difficult, but it’s the waggler angler and the pole exponent who get the best of the winter roach fishing. Bronze maggots are probably the most consistent bait, fished on or very close to the bottom. Thorough use of the plummet to find a shelfor deep water before any session is invaluable – and be prepared to fish slightly overdepth with the bait hard on the bottom to pick up the better samples. Really big roach are rare in Fen drains but scale-perfect specimens of 1lb (0.45kg) and more are by no means unusual on a good day. Groundbait is generally a real turn-off for roach. Loosefeeding little and often is a much safer bet to keep bites coming – half a dozen maggots each cast are usually enough to hold a shoal and keep its members searching for more. Only step up the amount when the fish are in a feeding frenzy. Winter is also when fishing for the Fen’s prime predator – the pike – really peaks. Though artificial lures pick up the occasional decent specimen during the warmer months, after the first autumn frosts live-baits and deadbaits score best. Those drains in the Great Ouse system that hold zander also produce their very best fish from autumn onwards. This is hardly surprising. The roach and bream pack tightly into dense shoals when water temperatures fall rapidly after the end of summer, and this concentration of fish in turn triggers the predatory species into activity. Huge catches of pike to 20 lb (9kg) or more and zander exceeding 10 lb (4.5kg) can be made by the specialist angler who arrives early and looks for signs of fish activity. Find the prey fish shoals and you can be certain that the predators are not too far away. Pike can be relied on to feed consistently right through the winter months. They may become lethargic in extreme Arctic conditions, but in general the cold weather sees the best of this species. Many Fen drains fish superbly on the still, clear days following very sharp overnight frosts.